· Just being generally great. · Had a best friend with four legs and pointy ears? Dead Famous is a series from Scholastic which features a person who is dead and very famous. I have reviewed several books from the series before in this blog such as Spartacus, Horatio Nelson, Charles Darwin and Writers and enjoyed each one of them. Thus, it was only time that I add one more and started reading about the Macedonian king, Alexander the Great. The book starts by establishing how Ancient Greece was not like how we know it as today. Greece had several kingdoms and city states and a dominant large kingdom among them was Macedonia. 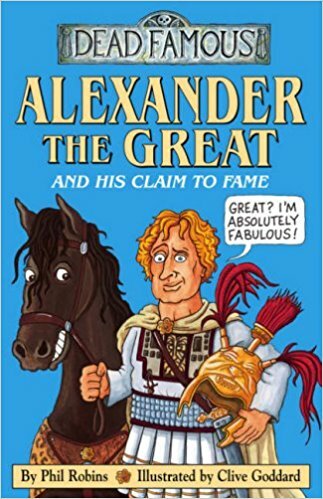 The book starts with how Alexander’s mother, has very high ambitions for Alexander and is willing to employ any means to get Alexander on to the throne. Post Alexander’s ascendancy, Alex’s adventures are described by the author as letters her is sending to his mother and his accomplishments being described in The Macedonian Mail. This follows all of Alexander’s conquests, his efforts to integrate the newly conquered Persia to his kingdom and his eventual death. The book was very well illustrated, as always, by Clive Goddard and I really liked the personal touch they tried to add through those letters that he supposedly wrote to his mother. Alexander’s personality was brought out very well – a great orator who can motivate his soldiers under the direst circumstances, a man with extreme determination and of course, a hard-core narcissist. The book not only brings out his personality, but also that of his mother who is willing to go any extent to ensure that her son manages to consolidate his power. The book covered nearly each of the well-known conquests of Alexander, starting with Egypt, followed by Persia and finally India; supported by well-illustrated maps. However, a conqueror’s biography with inadequate description on battles and strategies thereon makes the book incomplete. For instance, the famous Battle of Gaugamela was barely half a page long and other battles, even less, sometimes even a one liner stating that ‘the Macedonian Army secured a decisive victory’. This is a good light read, you get to know about ancient Greek History mixed with a lot of humour and fun and on that note, I would rate the book a six, with the rating mainly cut owing to the lack of detail on battles.